- News: All news about Pino Daniele. - Biography: Full Pino Daniele biography, from first year of his carrier to nowaday. - Discography: All songs and discs, album covers, some reviews, Italian charts. - Events: All Pino Daniele Carrier Events. Interview and comments. - Massimo Troisi: The Italian artist Massimo Troisi, Pino Daneile friend. He died prematurely during the filming of 'Il Postino'. - Mid Files: Some mid files about Pino Daniele best songs. Pino Daniele was born in Naples on March 19, 1955. He studied in Naples and here he received his diploma but his desire was to study at the conservatory. He began to play, in fact, at the age of twelve, in the middle of the beat generation. His first guitar was an ECO X27 with Paramount Meazzi 10W. His first performance at a party of his friends. In the early '70s he had his first musical experience with the jazz-rock band called "Batracomiomachia". The socio-political environment of that time prompted him to reread the themes of traditional Neapolitan folk song with an innovative and modern look, combining Mediterranean rhythms with America ones, till African ones. In that time, he collaborated with James Senese (saxophonist of the group "Napoli Centrale") which generated a good feeling. But the event that marked the start of his brilliant career was his meeting with Rosario Jermano. Under the guidance of his drummer friend, Pino Daniele began to produce a series of songs that reflect a particular style of music including blues and traditions. In 1976 he recorded his first single "Che Calore" and his first Album "Terra Mia", everything with a pleasant fusion between rock and blues. His musical style combines blues, his great love, to jazz till the traditional Neapolitan music. The 1980 is the year of "Nero a met�". The language used by the singer in this initial work is personally coined; an exciting Anglo-Neapolitan language. In that year (1980), he opened the Italian event of Bob Marley Tour. Next year, he called the best artists of the Neapolitan music of the time and from this union was born a "Vai mo'". At the height of his success in his native town Naples, he organized a concert event in 'Piazza del Plebiscito' that gathered more than 200,000 people. In 1982 he produced "Bella 'mbriana", in that year Pino Daniele collaborated with saxophonist Gato Barbieri and he started a tour all over the world. In 1984 he played with Santana and Bob Dylan in Milan at San Siro Stadium. In 1989 he faced a series of surgeries on his vocal cords that changed his vocal timbre, but in 1991 Pino Daniele produced "Un uomo in blues" with its most rappresentative single "'O scarrafone". The same year, he wrote "Quando" that rappresents one of his worldwide hits and his new album "Sotto 'o sole". 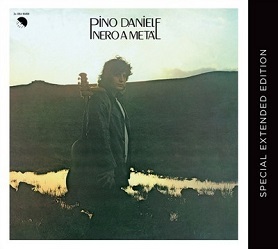 In that years, Pino Daniele became increasingly commercial and he lost his original spirit of rebellion. Under those assumptions he produced "Che Dio ti benedica" (1993), "E sona m�" (1994) and "Non calpestare i fiori nel deserto" (1995) with the return of Afro-Mediterranean rhythms. Africa returned in 1999 with "Come un gelato all'equatore" while in the nest year (2000) he produced "Medina" that presents Arabic rhythms. After "Medina", he produced "Concerto" (2001) and "Pino Daniele Project - Passi D'Autore" (2004). In "Passi D'Autore", Pino Daniele made experiments of new rhythms and musicality, he played jazz, the Bossanova and even the madrigals. A particular event of that "Passi d'Autore Tour 2004" was the concert in Naples at Piazza del Plebiscito on July 18 after 23 year absence. In 2005 he produced "Iguana Cafe'" which marked a return to dominance of the guitar in his music. In 2007 he produced "Il mio nome � Pino Daniele e vivo qui" with its single "Back Home" which was intended to symbolize a return to his first musicality and he called to collaboration all his old friends. The 2008 was the year or a rich collection of his hits, "Ricomincio da 30", which contained 41 old songs and only 4 new ones. In 2009 he produced "Electric Jam" with electric sounds, while in the nest year (2010) he called to collaboration some famous italian artists producing "Boogie Boogie Man". In 2012, Pino Daniele has left the major record labels and he produced his new work "La Grande Madre" under his record label, the Blue Drag. 2012 was the year of a very imponent tour in Italy, Europe and USA. He continued this new adventure also in the 2013 with a new album 'Tutta n'ata storia' and a new world tour. The night between January 4 and 5, 2015, Pino died due to a heart attack. This page was visited 6128 times. Happiness to everybody. This site is dedicated to Pino Daniele and it's relized by Gennaro Esposito.